We are in the middle of a Nebraska summer right now and that means in most cases that the fishing has become a little bit tougher than it was a few weeks ago. The reason for that is simple, even though the fish’s metabolism is peaking in the warmest water of the year, the abundance of natural prey is also at its peak right now and fish do not have to look very hard to find more than enough to eat. Well-fed fish are tougher to catch. Feeding periods may be intense, but they likely will not last long. Right now a person has to identify high percentage areas and be sure to be there at times when the fish are most likely to be feeding. Most fishermen I know, and yes, I said fisherMEN on purpose, tend to be proud and hate to admit that they were not smart enough to figure out how to catch fish on one of those days when they get skunked. So, we make up excuses. I have heard a million excuses for not catching fish and one that frequently is used this time of year is that the “lake is turning over”. Every time I hear that excuse I say “BALONEY”. 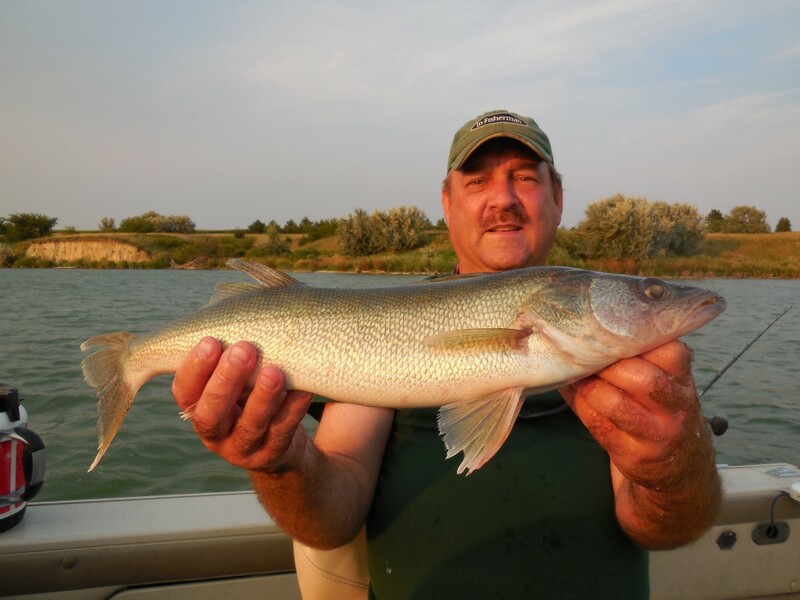 So let me return to an old blog post, give you a little lesson in limnology, the study of lakes, and tell you why there ain’t no stinkin’ “turnover” on Nebraska waters in the middle of the summer. This is going to get technical and “deep”, pardon the pun, but if you like to fish, you will learn something that will help you better understand the waters you fish and the fish swimming in them. And yes, understanding such things can make a huge difference! So, how do I know that a certain angler’s lake or reservoir was not “turning over”? Because a body of water cannot experience “turnover” unless it first stratifies, and most Nebraska waters do NOT stratify. So, in order to explain “turnover”, which happens in the fall, I first need to explain stratification, which if it happens, happens during the summer. Water is an amazing substance that has some unique characteristics. One of those characteristics is that water has different densities at different temperatures. Water is least dense or at its “lightest” at 32 degrees F, and that is why ice floats. Water is at its densest or “heaviest” at 39 degrees F. Since water has different densities at different temperatures, standing bodies of water (“lakes”) can stratify into layers of water that have different temperatures and different densities. Stratification can be so strong that those layers of water mix very little if at all. Let me give you an example of stratification. 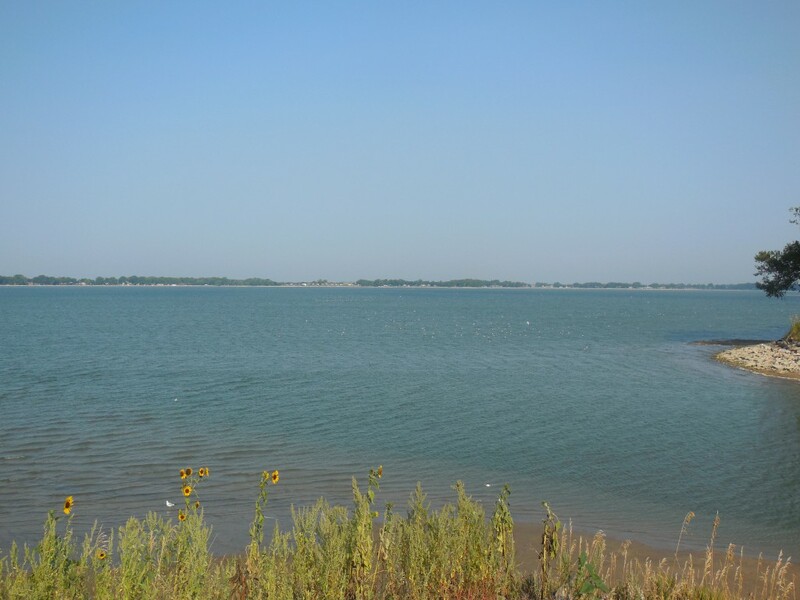 On Nebraska waters stratification typically occurs during the summer as water near the surface of a “lake” is warmed. If we looked at a cross-section of a Nebraska sandpit at the end of July and measured water temperature at 2-foot intervals from the surface to bottom, this is what it might look like. You can see warm water temperatures near the surface and then cooler water, deeper. That makes sense and probably comes as no surprise, but notice the drastic differences in water temperature on this Nebraska sandpit in the middle of July–the water varies from 81 degrees near the surface to only 52 degrees on the bottom! With that much difference in temperature, the water in that Nebraska sandpit will be stratified into different layers of water of different temperatures and different densities. In this example, and the data I am using actually comes from a Nebraska sandpit, there are two separate layers of water and those layers do not mix as long as they differ in temperature. The upper, warmer layer is called the “epilimnion” and the lower, colder layer is called the “hypolimnion”. On this sandpit there is a “band” of water between the epilimnion and hypolimnion where the water temperature changes dramatically (20 degrees F in 6 feet); that zone of change between the epilimnion and hypolimnion is commonly described as the “thermocline”. This stratification of water is called “thermal stratification” because of the difference in temperature and densities. Water bodies such as Nebraska sandpits can also stratify chemically along with the thermal stratification. My best way to explain chemical stratification is to add some dissolved oxygen readings to the illustration. You can see that the upper layer of water, the epilimnion, is exposed to the sun, wind and wave action and has relatively high levels of dissolved oxygen. During the summer, with stratification, the lower layer of water, the hypolimnion, does not mix with the upper layer of water and in most Nebraska waters that stratify, there will be little or no oxygen in the hypolimnion, deepest water, during the summer. Relatively infertile, large, deep, natural lakes found way north of Nebraska can have oxygen in the hypolimnion during summer stratification, but not Nebraska waters (and that is why Nebraska has no lake trout). Sand and gravel pits are the bodies of water most likely to stratify in Nebraska. Those waters are relatively deep for their size and they are small and relatively protected from the wind. In addition, groundwater inputs produce an even more dramatic difference in water temperatures from surface to bottom. Some reservoirs in Nebraska have relatively deep water, but surprisingly most Nebraska reservoirs do not stratify. As we all know, the wind blows in Nebraska and most of our reservoirs are so open and windswept that it prevents stratification. Water temperatures on the surface may begin to warm enough to begin stratification during a stretch of sunny, hot, calm weather, but as soon as the wind blows, that stratification is broken. The open, windswept nature of most Nebraska reservoirs results in continual mixing and stratification is weak if it occurs at all. Nebraska reservoirs may mix frequently if not continually all summer long, but there is no “turnover” event. OK, that is stratification, now I can talk about “turnover”. In the fall, water temperatures begin to cool. In a stratified body of water, the upper layer of water, the epilimnion, will cool as air temperatures cool. Eventually, temperatures in the upper layer of water will be similar to temperatures in the lower layer of water, the hypolimnion, and that also means the density of water in those layers will become similar. Then it takes very little energy to mix the entire water column from surface to bottom. Typically, this mixing or “turnover” will occur once water temperatures in the epilimnion and hypolimnion are close to being the same and the wind blows. On waters that stratify during the summer, the fall turnover may be the first time in months that deep water is re-oxygenated. Typically, there will be a lot of organic matter that has accumulated on the bottom in deep water, and once turnover occurs some of that organic matter may become mixed into and suspended in the water column. On some waters “turnover” can be noted as water quality will decline for a few days after the water column is mixed. A person might even notice an odor from all the organic matter that has been mixed into the water column. If you have read this far you now know all about stratification and turnover. You have completed one Limnology 101 lecture. But what does it all mean? Well, for one, if you fish a Nebraska sandpit during the summer you do NOT want to be fishing on the bottom in the deepest water. Chances are that your favorite Nebraska sandpit stratifies and during the summer there is little or no oxygen and NO fish in deep water. In fact in this example sandpit, all the fish will be living in less than 14 feet of water during the summer! Secondly, because the wind blows in Nebraska, most Nebraska waters do not stratify during the summer or if they do stratify it only lasts for a day or two. Turnover never occurs on most Nebraska waters because they never stratify in the first place. Most Nebraska waters are mixed from top to bottom most of the time. Water temperatures will be similar from top to bottom most of the time and oxygen levels will be similar as well. I did not say temperature and oxygen levels will be uniform from top to bottom, but there will be no dramatic differences, not enough difference for stratification to occur. Anglers may note changes in water quality or water color on waters that do not stratify and blame that, and their lack of fish on any given day, on “turnover” when in fact there is no turnover on those waters–the water mixes all the time. So why do folks say that a reservoir is “turning” or “turning over” in the summer? Likely because they see a decline in water quality or more correctly a decline in water clarity. That frequently happens on Nebraska waters in mid-summer because our waters are all relatively fertile and during the heat of summer a variety of algae blooms can occur. Those algae blooms reduce water clarity, and absolutely can impact fishing success, but it ain’t because of “turn over”. Since I mentioned algae, folks also may have heard of the bluegreen algae blooms that can be a cause for concern on some waters especially during mid- to late-summer. For some additional information and perspective on bluegreen algae and bluegreen algae blooms, take some time and look at this, Bluegreen Algae . On waters that do stratify, fishing can be tough for a short time after turnover occurs IN THE FALL. Turnover can be a major change in the environment, and it may take fish a few days to adjust to that change. However, turnover still is more of an excuse for tough fishing in most situations. In many waters the fall cooling will be very gradual and when the turnover finally occurs it may be hardly noticed. Turnover in most waters is nothing more than a gradual, seasonal change, a progression and not a sudden, point-in-time event. Anglers should be aware that on waters that stratify during the summer, fish will eventually be able to move back into deep water as the fall progresses. Once the water column is mixed, fish may be found anywhere from the surface to the deepest water. Fall fishing patterns may include everything from shallow water in bays and along shorelines to some of the deepest water to be found. May be no “turnover”, and maybe no excuses necessary?